Northern California & Coastal Valleys - What are you doing this month? Re: Northern California & Coastal Valleys - What are you doing this month? Okay, you win! Goats? weed whacker? Actually, the weeds are from wind-blown seeds that end up in the sanded cracks. Ken used to spray Roundup but you know that stopped when I started "organic" sfg. That's why I am hoping the vinegar and Epson salts works. Testing, testing. Looking good in the area sheltered from the rain. When we had 2" rocks in some of the non-planted areas, it was a bear to pull the weeds. After a few years, the rocks were removed (gave away free on Craig's List for anyone to pick up on the drive way). I love the wood chips. So much easier to pull up the weeds now. I looked at a study of various ground covers and how they behaved during fires. The plain wood chips actually rated quite high. They slowly smoldered instead of flamed. Maybe I posted the link under CA Drought. ?? BigDog, Suz is the one with the goat heaven. I'm the one with the brick weeds. BD and TD, Ken keeps wanting to buy a flame wand and I say no. Give the neighborhs the idea and they will burn down the neighborhood. Some of them really don't take care of their yards. Tall weeds or dead grass, bare dirt or weeds in the "flower beds" and I use those words lightly. I whole heartedly agree with CC, break out the Snapper and keep it at 3", you could have a lush picnic area. Set up some tables, put up a sign sayin' "Picnickers Delight - 10 bucks an hour and free parking for the first 4 cars, complementary well water included." Actually, I may put up a sign -- "Compost Garden." I never have enough green in my compost. These lush weeds will be a welcome addition. They aren't that hard to pull up, but it will take me a couple of weeks to get it all done. The good news is that they won't come back again until next year. When the rains stop, all we have to do is withhold water. Voila! All gone weeds. Great use if you can pull them before they go to seed. Sanderson ... Get rid of the regular sand between the bricks and use polymeric sand. It provides a barrier that helps stop weed seeds from getting a hold. It works great on my patio. Where I don't have it on the bricks alongside the driveway, the weeds are a nightmare. The problem with polymeric is that the stuff that binds the sand together may wash into your BTE garden. So you need to ensure that it is not a danger. Now here is an idea, use the poly sand, hit it with the torch, see what you come out with- polycementbond weed barrier For those of you who are a Humphrey Bogart fan, I reworded a line out of Seirra Madre. Happy to announce that my experiment with a vinegar, Epson salts and Dawn detergent works! I sprayed some weeds, went to the dentist, came back and they were crispy brown! 2 c.white vinegar, 1/4 c. Epsom salts and 1 teaspoon of Dawn. Dissolve well. @sanderson wrote: Happy to announce that my experiment with a vinegar, Epson salts and Dawn detergent works! I sprayed some weeds, went to the dentist, came back and they were crispy brown! Putting down a thick layer of wood chips in the walkways of my sfg. Turns out it's right in the path of the water runoff when it rains. It's still a swamp back there after several dry days, but gonna rain again tonight and tomorrow. I hauled in several loads to make it 5-6" deep, but I'm still less than halfway through. The good news is that I have plenty of wood chips to cover everything that has weeds this year. The bad news is that there's only one of me to do it, so the going is slooooooow. I posted in another thread that I forgot to start any winter squash seedlings. And most of the cucumber and cantaloupe seedlings dampened off. 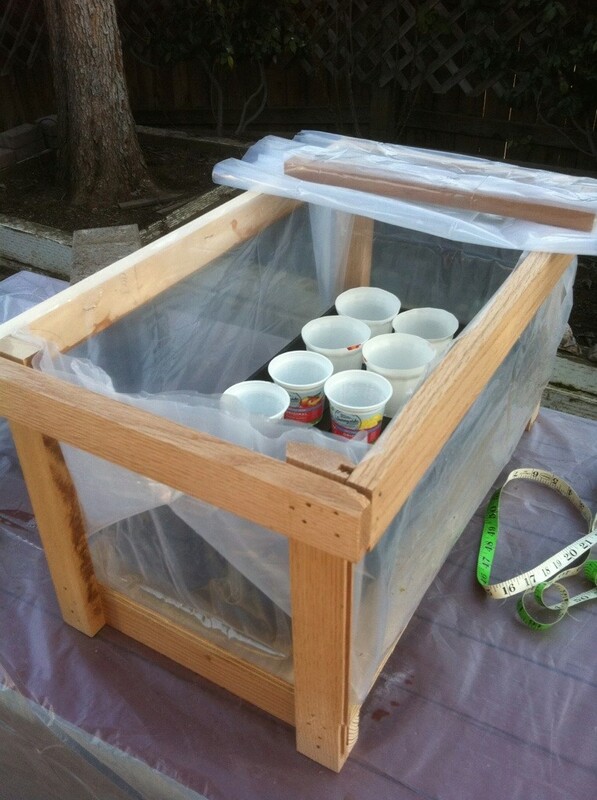 I will start new seeds today or tomorrow and put them in the mini-hot house from 2013. The plastic is long gone so I will have to make a new liner and cover. The critters that are digging in my boxes and earth strip are stealthy. I will need to tangle myself all up in bird netting soon to protect the seedlings if I want anything to survive. I'm betting on the 3 red bushy-tailed squirrels I saw on the back fence. They aren't even afraid of my scowl. They just stared at me and slowly hopped away. And, I mean slowly. Oh, did I mention several of the tomatoes already have the curly leaf virus! Good thing I planted 30! I spotted a white tailed bunny in my garden. He/she just stared at me until I moved toward the door and then merrily hopped away.... the struggle is real!!! Got a few of those cottontails edging my lawn and trimming back some invasive Mexican Primroses-OK by me. But one has broken ranks and is getting a taste for parsley and Kale. They're so cute I don't want to do much, but I'm hopeful that the neighborhood hawks have an appetite for bunnies. Bought a small animal Have-A-Heart. 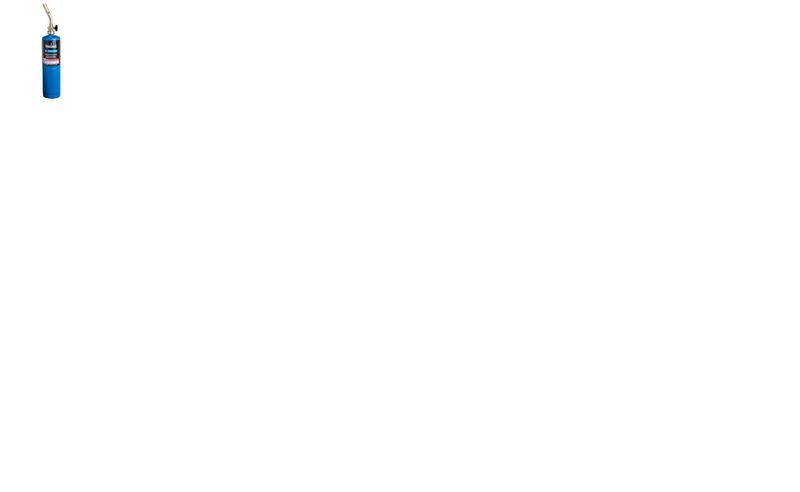 We will see. Last night/this morning they hit several beds and the sweet potato totes. I have seeds to put in the earth strip and I want to relocate these pests first. A deluxe park not far away. @Yardslave wrote: Got a few of those cottontails edging my lawn and trimming back some invasive Mexican Primroses-OK by me. But one has broken ranks and is getting a taste for parsley and Kale. They're so cute I don't want to do much, but I'm hopeful that the neighborhood hawks have an appetite for bunnies. We have so many cats we never have garden pests. 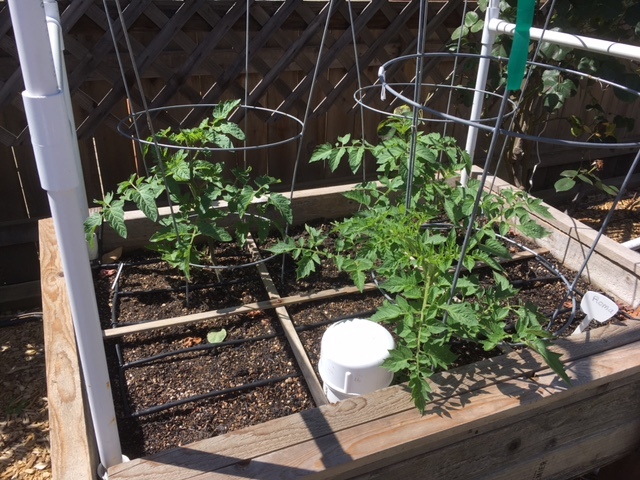 OTOH, this will be my first year to garden "outside the box" and we do have skunks, raccoons, and a opossum that come up on the deck to eat dry catfood at night. If they develop a taste for veggies, we'll have to fence in the new BTE, but the chickens may force that issue anyway. I would like to join everyone in carrot week, but I laugh thinking about carrot seeds in this wind. Finally have all 30 tomatoes planted. The ones in the table top beds have developed thick stems, I think, due to the winds. 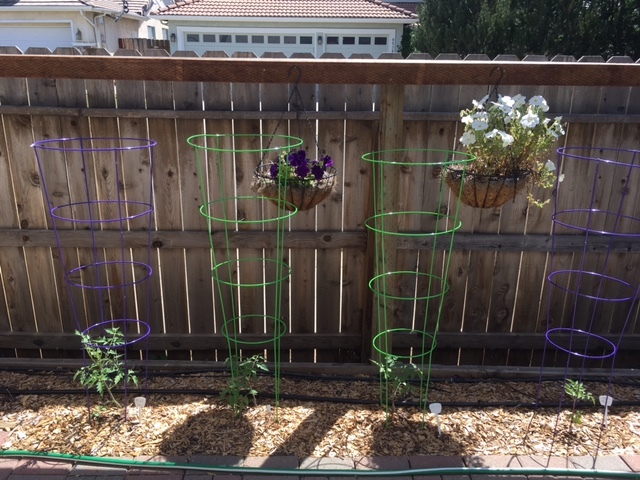 Bought 5 more tomato cages so that all tomatoes have either cages or overhead support. It looks like a few have the curly leaf virus of 2016. 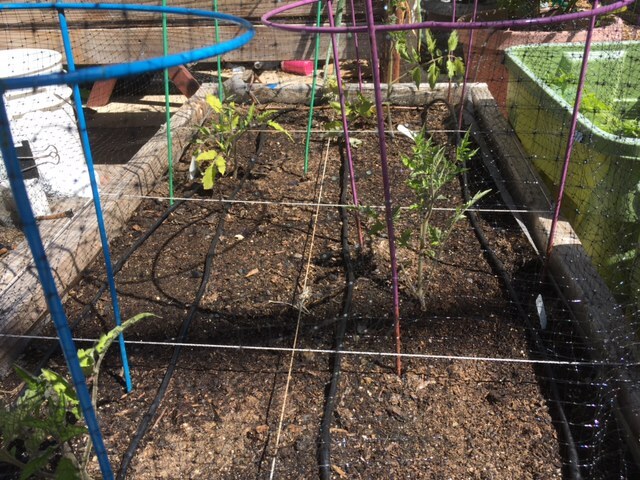 I covered 4 of beds with bird netting to keep the squirrels out. Now I'm worrying about snaring a bird. No snakes in the residential area. We bought a small critter Havahart trap and baited with apple slices and a trail leading up to the trap. Not a nibble. Have they moved on to some other house? Haven't seen any since I watched a squirrel eating a missed orange. I did manage to plant Silver Queen corn and Egyptian okra in the dirt strip. Still have the Gem corn, sorghum seeds and 3 sunflowers to plant along that area. I'm pleased at how wet this area still is under the wood chips. Yesterday, I direct sowed the cantaloupe, watermelon and winter squash. Squirrels, I'm watching you. I have a decision to make about the cold, neglected hot compost pile I started this winter. I only turned it once and then the rains started. It never reached 160*F for killing seeds and pasteurization of horse manure. I have lots of mowed alfalfa, a half 3'x3'x3' cage of fizzled compost and about an equivalent of 1/4 cage of cold garden/kitchen compost. The cold compost was supposed to be for the landscape areas. Now I'm thinking that if I combine the 2 composts, plus the alfalfa, half a bag of leftover horse manure and a tad of blood meal, could I make a new hot pile?? If I stay on top of the turning, it will be finished and cooled within a month. It makes a good first layer of mulch, which, when topped with light-colored chopped straw keeps the roots cool in June -Sept.
RE: Northern California & Coastal Valleys What are you doing this moth? Another Big Thanks sanderson! Last year You suggested that I use shade cloth and straw for mulch, well I got the shade cloth going and the other day I went looking a bale of straw I ended up at Tractor Supply and ended up with a compressed bale Alfalfa and salt grass it was packaged in green plastic so I couldn't see what I was buying, when I got home and opened it, It was very green as is alfalfa but there was a lot of course stems also so I used my compost screen to separate the stems which I will use for mulch I ended up with quite a bit of Leaves and hopefully any seeds wasn't sure what to do with it until I read Your post about putting alfalfa into the compost pile Thanks again. 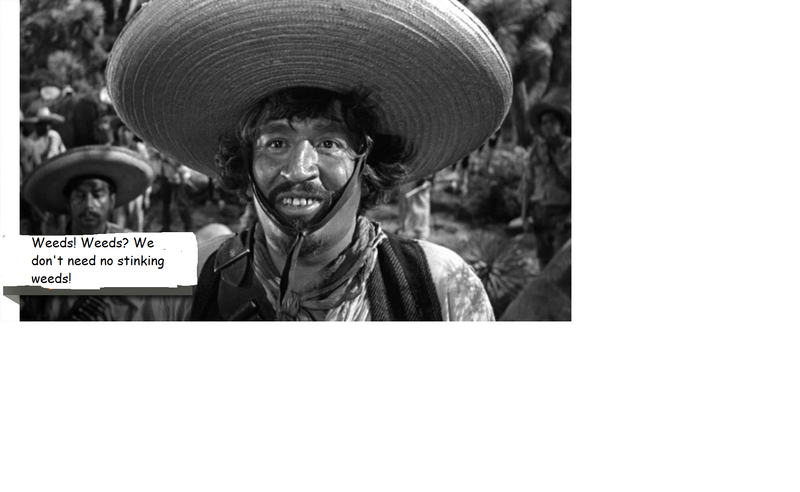 I had to look up salt grass. I looks like it uptakes salts in poor soil and can have salt crusted on the stalks. Just be on the alert for any salt issues. Wind gusts up to 35 mph today. I did manage to get the last corn and sorghum seeds planted but I had to chase down the seed packets! Wow sanderson ... "30 tomato plants"! Where do you grow them and what do you do with all the tomatoes? I had 8 plants last year and that was a lot for us. I'm hoping to get enough to can this summer. 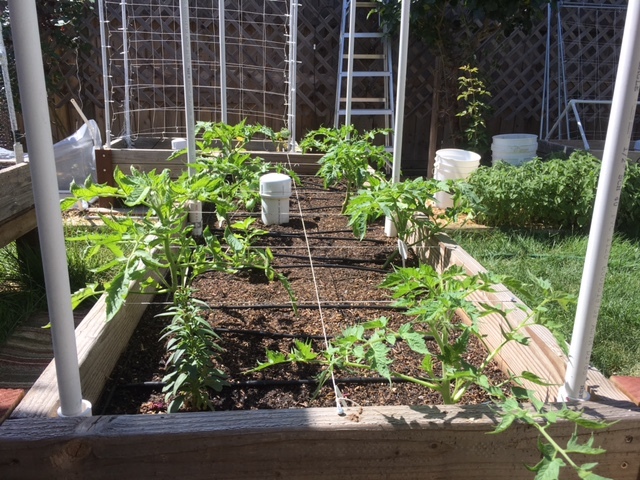 I am the only person in Fresno who can't grow tomatoes! Two summers ago I did get some canned but last year it was another virus year. Photos later. Kind of dark right now. @sanderson wrote: I'm hoping to get enough to can this summer. 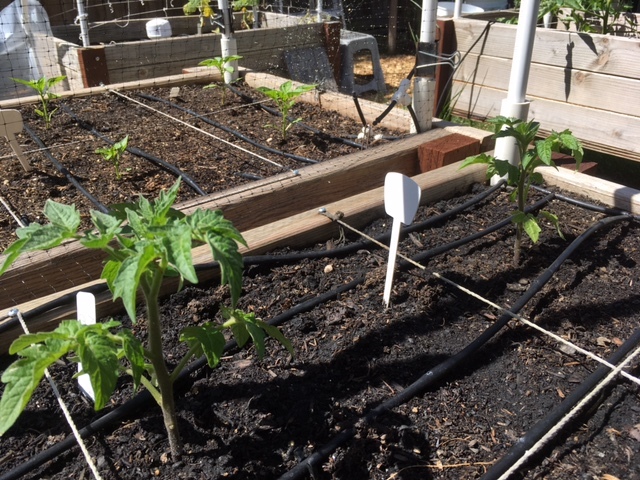 I am the only person in Fresno who can't grow tomatoes! Two summers ago I did get some canned but last year it was another virus year. Photos later. Kind of dark right now. I was wrong in my last post I said I got a bale of Alfalfa And Salt Grass, I checked this morning it was Alfalfa & Orchard grass and it's green but the sun is bleaching it yellow so I guess I'm good with the color. Thanks for the info on alfalfa being a green for compost, I turned my pile again this morning and added the alfalfa. I remember When I was a kid in California seeing pickup trucks going down the road with a load of green alfalfa just a smoking, so I know green alfalfa is hot just hope this dry stuff has some heat. Forgot these two Snow Fairies in the herb bed so it's a total of 32 planted. Four of 9 in the BTE. Seven indeterminate in 2'x7' bed. Some are showing signs of the virus. Five of 7 in buckets. 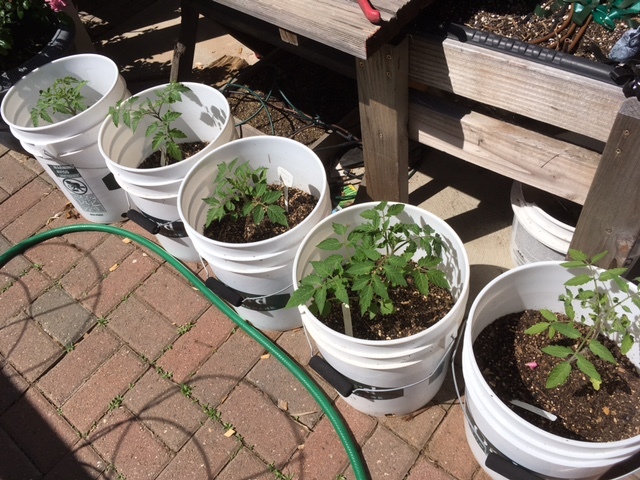 When it gets too hot, the buckets will be wrapped with aluminum foil to keep the roots cool. Wow.... look at her grow! Looks so nice, Sanderson! I hope you have a successful tomato year this year. You deserve it. @CapeCoddess wrote: Wow.... look at her grow! Looks so nice, Sanderson! 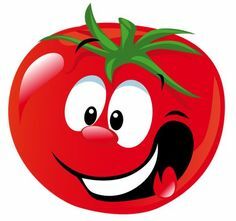 I hope you have a successful tomato year this year. You deserve it.